Anaximander of Miletus (c. 610 – 546 BCE) is thought to have been a student of Thales, the Ionian Greek philosopher also of the city of Miletus, who started philosophy in the early 6th century BCE. Like his mentor, Anaximander was concerned about what things were made of, how things were formed, and how things changed. Likewise, he did not credit personal gods for the happenings that humans observed around the world. One example of this is Anaximander’s hypothesis about thunder and lightning. In Greek mythology, these phenomena were attributed to the god Zeus, who literally threw lightning bolts that he carried around in his pocket. That’s not something that you could really test and disprove if you defined Zeus as an extremely powerful being capable of hiding himself within clouds (as he did on several occasions in the Greek myths). But Anaximander proposed that thunder resulted from two clouds crashing together, sometimes generating a bright flame if the movement of air from the interaction of clouds was very strong. This was not something that the ancient Greeks could test either, but at least the mechanism depended only on the presence of air, water, and clouds –things whose presence in the world were not contested by anybody. 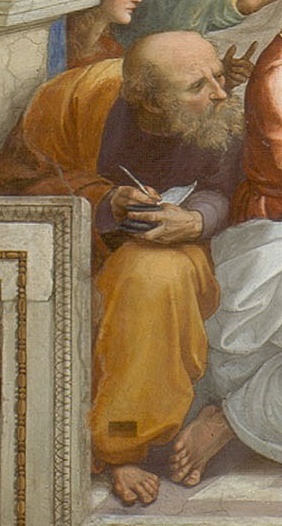 Detail of Raphael’s painting “The School of Athens,” possibly showing Anaximander here leaning towards Pythagoras on his left (not shown). Anaximander also thought that Earth was shaped something like a drum, a short cylinder, with the continents and life forms located on one of the circular faces. Though it was way off from the real shape of Earth, Anaximander envisioned his oddly-shaped planet as floating within a substance, the Apeiron, a word that has been translated to mean something like ‘boundless’ or ‘indefinite’. This was related to his point of disagreement with Thales. Whereas Thales thought the source of everything was water, Anaximander thought the Apeiron filled this role. Since Anaximander’s Apeiron has been likened to a kind of undetectable part of existence that would become the focus of later philosophers, and that dominates many religions today, some historians of philosophy have considered Anaximander as the originator of metaphysics. They consider his ideas as being more advanced compared with his mentor Thales and also more advanced compared with his student, Anaximenes, the subject of our next post. Another perspective is that the Apeiron was the way that Anaximander expressed his idea (common to many Ionian philosophers) that all matter contained some kind of vital force, or ‘hylozoism’. 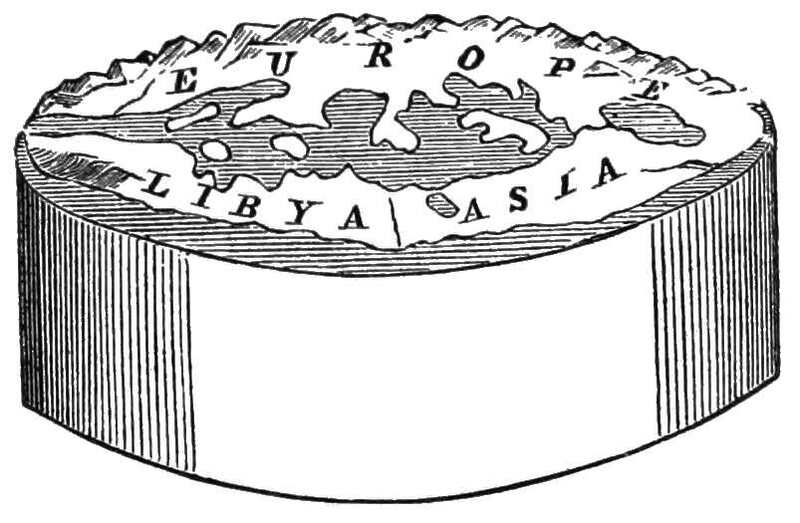 Anaximander’s concept of the cylindrical Earth. What’s important to the development of science is that Anaximander thought of his Apeiron as filling the space between the Earth, sun, moon, planets, and stars. This contrasted with Thales’ model in which Earth was only the land (continents), floating on water (the ocean), while the sun, moon, planets, and stars moved above, with air above the land and ocean at the bottom of everything. In Anaximander’s cosmological model, Earth, including the water, was suspended in the Apeiron, with nothing holding it up. This meant that the sun, moon, and stars, traveled around Earth, not just above it from morning to night, but also underneath. This may sound childish to us today, knowing that there is no “underneath” Earth, since gravity pulls everything from all around Earth’s surface toward the center. But if you consider that Greek mythology imagined the sun, Helios, as a god traveling each night by boat from the western end of the Earth to the eastern side in preparation for his rising the next day, Anaximander’s idea starts to look like a major advance. By postulating the Apeiron, Anaximander invented the idea of outer space, a necessary step before humans could think of the world as a planet going around something else. 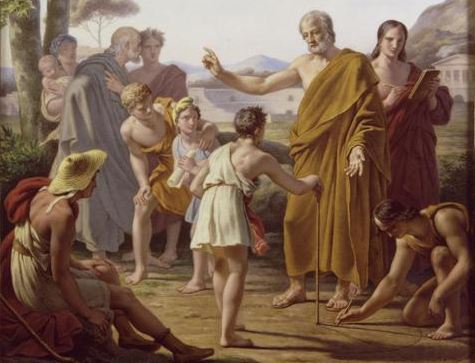 Anaximander teaching the art of the gnomon. Anaximander, like his mentor Thales, also recognized that life depended on water, but Anaximander saw water as the origin of life. 2,400 years before the birth of Charles Darwin, Anaximander theorized that life had begun in the water and that humans had evolved, very gradually, from fish or some kind of creature very similar to fish. Based on fragments of his writing preserved by later writers, it is likely that Anaximander developed his idea of “evolution” based on fossils that he had discovered and studied. He also reasoned that the first humans could not have been infants because human infants could not survive on their own, whereas fish were independent at the time of their hatching from eggs. So Anaximander decided that humans must have been around for much longer, possibly beginning as primitive eggs that emerged from the seafloor mud with no parents at all.